This year I had 4 seeds in my apple. While I stumbled a bit, I was able to find out my heart is healthy and I am doing pretty good with my blood work. I will be speaking at an event in November and continue to speak at Sacramento State. I am learning to take what comes and work with it. 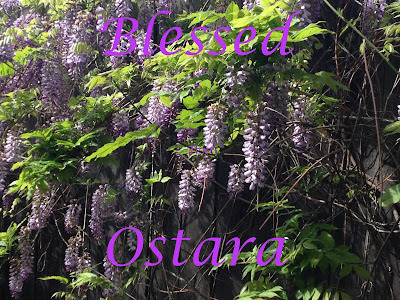 The Goddess is providing a wonderful learning experience with the path she is leading me on. I now see it will be harder than I planned, and I know for at least a year or so we need to be here in Sacramento. 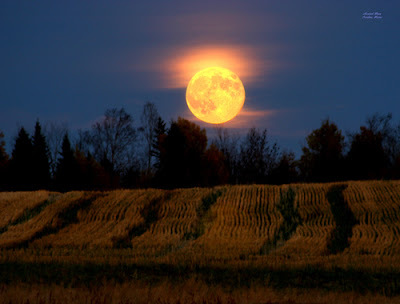 The Hunter's Full Moon or Blood Full Moon is the first full moon after Mabon (Autumn Equinox). In October, we see the Blood Moon travel through the sky. 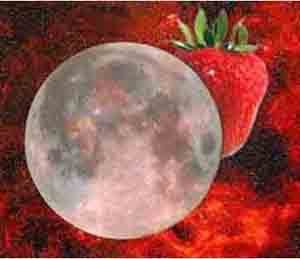 This moon is also called the Shedding Moon or the Falling Leaf Moon, depending on where you live. 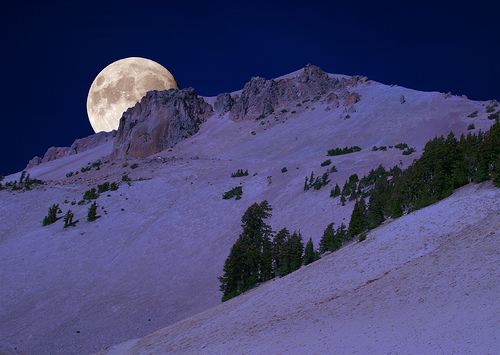 In many places, it's the Hunter's Moon - it's no coincidence that hunting season is in the late fall. 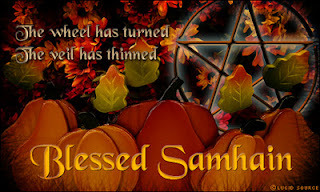 Coming right before Samhain, this is a time when the nights are crisp and clear, and you can sense a change in the energy around you. My daughter will be released from jail really soon. A new chapter will start where I will not know where she is or what she is doing and that is tough - letting go will be really hard for me. 1 I am continuing to eat healthy and to walk. I have had some backsliding but I will get back to where I want to be. 2. I got to speak in front of other therapists about how to work with transgender clients. 3. I am going with the flow knowing that is the path that the Goddess put me on. 4. I am looking into options on how to move away from Sacramento, but realize at this time it will need to be put on hold. Time goes so fast. It is now Lughnasadh. We celebrate together as we all work to bring in the harvest. This year my harvest has just started coming in and finally it is positive. We were able to take our 2nd Alaskan Cruise in July. We were able to go to Oregon and I saw one of my clients and now I am going to Seattle to a conference. I am really starting to enjoy my life. My son is doing well and starting his 4thyear of college and will start a 4 year college next fall. I am licensed and loving my new clients. Hoping to start to get on insurance boards sometimes soon. Not a lot of time yet to enjoy our bounty as we still have a lot to do - but we are starting to see what our hard work has given us. For me, I am enjoying my son's maturation and independence - he moved out and yet he does come by to see us. He is also taking a road trip with his girlfriend and I am so proud he is able to do that. I am enjoying and loving my career and being my authentic self. Coming up with more ideas for my practice and starting to feel better about the direction of my health. I am try to only look at this moment and near future and not obsess about the far future. Hopefully the harvest will be good. My Seeds of Intent1. Continue to get healthier and try to get all blood tests into the normal range. Getting closer to doing that - my blood work is coming back closer to normal. Taking care of health issues as they arise. Following my heart, working with clients, doing more Transgender work - figuring out the best way to handle certain situations. 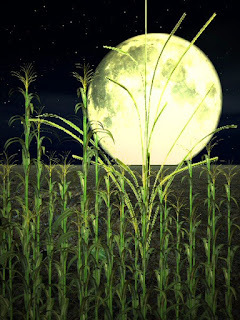 The Full Hay Moon is also sometimes called Thunder Moon. It is the first moon after the Summer Solstice or in this case on the Summer Solstice. As the name implies it is when we can harvest hay. At this time it is a good to start focusing on what we will do with our harvest and how best to harvest the fruits of our labor. That last sentence may seem backwards but you must first know what you want to do with your fruits - to know how to harvest. For example if something did not work out like you wanted, it might be best to learn from it and use it as fertilizer for the next set of crops. Maybe the fruit just wasn't so sweet so maybe you will dry it instead of canning it. This lets you know how you will go about harvesting it. In my personal life, this year, my hubby and I are going on a cruise in a month. It will be the 2nd time in two years. I am excited to spend time with my hubby in a cool and natural environment. We are harvesting the good. I also got my Oregon Marriage and Family Therapist License. I am working to find my happiness. I have applied for my license in Oregon in hopes that I will be able to spend more time closer to the ocean. I am working with my seeds of intent to be able to live some place that I enjoy. I am also learning what empty nest is like. I am finding it freeing to be in this new part of my life. So after nearly 2 years of waiting to testify against the horrible person who raped and tortured my daughter, he was let go. My daughter could not be found so they dropped the charges. It worries me and breaks my heart because he will go back onto the same streets my daughter is living on and she is in danger. I did everything I could to protector but in the end there wasn't anything I could do. My heart breaks and now I must start moving on. The day was so beautiful. I went to therapy and am feeling much better about moving forward in my life. No longer having a trial hanging over me, I feel like I can move on and move forward in my life. I am walking and have joined several "virtual races" to keep me motivated. I found an awesome type of therapy called Wisdom Path Parenting and I love how it connects my spirituality with parenting. I applied for my license in Oregon. I am putting my practice online so I am more mobile. So Monday the DA in Bakersfield told me that they are trying to get a courtroom so they try next on Thursday. I feel like this is never ending. I had to wait through November and December last year and then they decided to dismiss and refile because it had gone on so long and then we had to start all of the beginning stuff again. Hopefully this time it will happen in the next few weeks and this chapter of my life can be over with. Going on 2 years is a long time. Tomorrow we will find out if my daughter is going to follow through with testifying. Hopefully she will contact the DA and move forward. I would get to see her if that is the case. I just all of this over with but I want it over with by him going to prison so he won't hurt anyone anymore. So it looks like my daughter is not going to cooperate with the DA and testify on the case when Michael Lenoir tortured her. I am so frustrated, he may just be let go. Monday the DA will see if she hears from my daughter and then decide to see if they can put forward a plea deal. It would be such a disappointing ending for this drawn out drama to just let him go. I still hope my daughter will testify. I hope there is something we can do otherwise he will be out and able to do this again. I have been struggling so much to not let the mean things my daughter says to get to me but it always gets me especially when she basically says I was a horrible mom. I just don't know how to let it go and know that is where she is right now. Each time she says it I feel like I want to defend my parenting by telling her all I have done. I just can't do that - it doesn't help. I need to let go of the hurt and now that that is her perception currently and it may or may not ever change. Yesterday was valentines' day. I was working hard to have a good day with my hubby. Almost as if it were a warning, in the evening as I got out my pizza stone, it fell and broke into many pieces. Within a minute the phone rang - I looked and it was most likely my daughter calling from a phone at a gas station snack place. I had to make a choice, answer it and most likely be upset or just let it go. It is a slow process for me to learn to allow myself good things to happen and not allow others to sabotage them (even if they did not mean to). Part of my heart breaks that I cannot pick up the phone and expect a nice conversation with my daughter and the other part is desperately trying to heal. I am working on healing myself and trying to find a healthy level of interaction with my daughter. I know it is not her fault the way she is but there is only a certain level of dysfunction and drama I can handle before I start to slide down that dysfunctional hill again. I am dreaming of living in a place like this - the thought of seeing whales and hearing the ocean calms me and I hope that I can make this happen. I am back to exercising and now I am doing virtual races which are giving me more incentives. Found a therapy model called Wisdom Path Parenting and it fits me really well. Hubby and I are now actively looking at our options and we both have an idea of what our next steps are.